Things have been moving fast for NASA in recent weeks, culminating in President Obama’s inspiring speech at Kennedy Space Center on Thursday. I haven’t commented on the new direction for the US space agency’s direction thus far as I’ve needed some time to digest the ramifications of these plans. But generally, I’m positive about the scrapping of the moon goal in favor of a manned asteroid mission (by 2025) and Mars some time around 2035. But it hasn’t been easy, especially after the Ares I-X test launch in October 2009. The Ares I-X was the first new NASA manned vehicle my generation has seen take to the skies (I was only one year old when the first of the shuttle fleet launched, beginning nearly 30 years of low-Earth orbit operations, so that doesn’t count). Despite criticism that this test flight was nothing more than old tech dressed up as a sleek “new” rocket, I was thrilled to see it launch. But the overriding sentiment behind Obama’s new plans was that we’ve been there before, why waste billions on going back? Continuing with the bloated Constellation Program would have used up funds it didn’t have. Cost overruns and missed deadlines were already compiling. So, the White House took on the recommendations of experts and decided to go for something far riskier than a “simple” moon hop. Things going to plan and on schedule, in the year 2025 we’ll see a team of astronauts launch for a much smaller and far more distant target than the moon. The asteroid plan has many benefits, the key being that we need to study these potentially devastating chunks of rock up close. Should one be heading in the direction of Earth, it would be really nice to have the technological ability to deal with it. A manned mission may be necessary to send to a hazardous near-Earth asteroid. Think Armageddon but with less nukes, no Bruce Willis, but more science and planning. Besides, if a rock the size of a city is out there, heading right at us, I’m hopeful we’ll have more than 18 days to deal with the thing. Possibly even more exciting than the asteroid plan is what — according to Obama — will happen ten years after that: a manned mission to Mars. I can’t overemphasize my enthusiasm for a mission to the Red Planet; that will be a leap for mankind like no other. Granted, there is plenty of criticism flying around that we need to live on the moon first before we attempt to land on Mars, but looking at the new plan, we won’t be actually landing on Mars any time soon. A 2030’s mission to Mars will most likely be a flyby, or if we’re really lucky, an orbital manned mission. And that’s why going to an asteroid will be a good first step. Spending months cramped inside a spaceship with a handful of crewmates will likely be one of the biggest challenges facing man in space, so popping over to a near-Earth asteroid first is a good idea. A Mars trip could take over a year (depending on the mission). Now, this is where technological development sure would help. If NASA can plough dedicated funds into new technologies, new life support and propulsion systems can be developed. Those two things will really help astronauts get places quicker (avoiding boredom) and live longer (avoiding… death). For the “living longer” part, there appears to be genuine drive to increase the life of the space station and do more impressive science on it. As it’s our only manned outpost, perhaps we’ll be able to use it for what it’s designed for. There are a lot of unknowns still, and Obama’s Thursday speech certainly wasn’t NASA’s silver bullet, but it’s a start. Allocating serious funding for space technology development whilst setting the space program’s sights on going where no human has been before will surely boost enthusiasm for space exploration. In fact, I’d argue that this is exactly what NASA should be doing. Although I was dazzled by the Ares I-X, I can see that continuing with Constellation would have been a flawed decision. Launching a manned mission to explore an interplanetary threat sounds risky, but considering that asteroids are the single biggest cosmic threat to civilization, it sure would be useful to know we have the technology to send astronauts to asteroids, perhaps even dealing with a potential threat in the near future. In agreement with Phil Plait, this video made me smile too. A lot. President Obama (now a Nobel Peace Prize recipient) hosted an astronomical party on the White House lawn on October 7th for an audience of 150 middle school students from the Washington area and some guests of honour (including Charlie Bolden, NASA Administrator and Buzz Aldrin, Apollo legend). It looked like a really exciting event for all the school kids involved. “So, there are a lot of mysteries left, and there are a lot of problems for you students to solve, and I want to be a president who makes sure you have the teachers and the tools that you need to solve them. That’s why we’re working to reinvigorate math and science in your schools and attract new and qualified science teachers in your classrooms, some with lifetimes of experience […] That’s how we’ll move American students to the top of the pack in math and in science over the next decade to guarantee that America will lead the world in discovery in this new century.” –President Barack Obama, Oct. 3rd. Was there ever an astronomy party on the White House lawn during the previous administration? The National Space Society has done great work in the realms of space science outreach and project funding, and to be honest, I’m behind any non-profit that whips up enthusiasm and furthers mankind’s efforts in space. They are outspoken critics of space policy and NASA, which is usually pretty fair. Assume that President Obama doesn’t care about NASA. When there was a talk of a missile gap [during the Cold War] NASA was important to show our technical prowess in a non-threatening way. NASA hasn’t been important to the President since. Presidents want NASA to demonstrate America’s technological leadership and not kill any one, that seems to be about it. It is time for NASA to grow up and take responsibility for its self and its accomplishments, and do so within a flat budget. Don’t expect to see Apollo level funding again. Don’t expect a President with 2 wars going on, a third one possibly on the horizon, the worst economic crisis in the last 80 years, and a health care crisis to worry about NASA. Barrak [sic] Obama put NASA in the able hands of Charlie Bolden and Lori Garver so he wouldn’t have to care about NASA and could simply make speeches about the wonderful things NASA is accomplishing during his administration. Yey! Go US spaceflight! Woohoo! Doesn’t that make you feel all warm and fuzzy inside? It’s one thing to criticise NASA and US space policy, but this is incredibly defeatist for an organization that should be working harder to promote the importance and shape the future of NASA science. Come on NSS! I’d happily see more enthusiastic videos about how a new spaceflight industry will save the economy (even if it’s unrealistic) rather than read someone’s depressing, and frankly limited, opinion that Barack Obama (note the correct spelling) doesn’t give a toss about NASA. 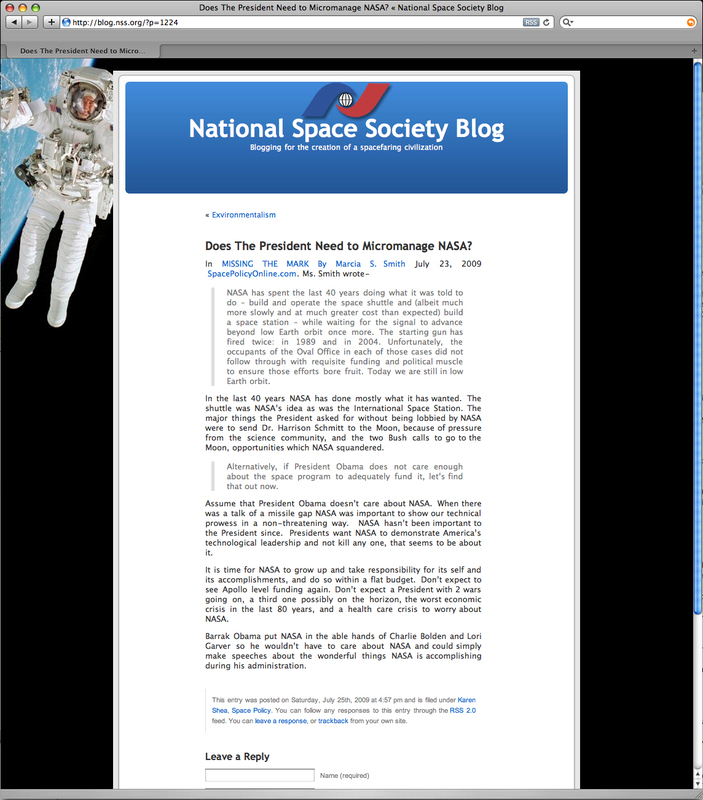 Ouch, this is rather gloomy and depressing talk from the National Space Society’s official blog given that two of its former Executive Directors are at NASA – one being Deputy Adminstrator and the other being Chief of Staff – and hold opposite, hopeful views of what lies ahead for NASA. It is also odd that the webmaster of this blog does not even bother to spell the President’s name correctly. NASA is an easy target for critics, and the agency certainly has its problems, but I think this is a surprising cheap shot from a blog of the biggest US space advocacy non-profits. Can a Mission to Mars Stimulate the Economy? When times get tough, the world needs visionaries. Visionaries find solutions, they invent systems and invoke change. One such figure in current events with a weight of 300 million people on his shoulders, is the new US President Barack Obama. His entire political campaign is based on bringing change to the USA (and the world), making him the most prominent political figure out there. Is he a visionary? Some would argue that he is, others would say that history will decide that point. I’m on the fence as to whether Obama will find historic solutions to these seemingly insurmountable global crises. But the thing I admire about the new US President is that he is a strong leader, and sometimes, that is all a country needs to pull itself from the precipice and back to prosperity. Author Ian O'NeillPosted on February 8, 2009 Categories NASA, Opinion, Space FlightTags Barack Obama, Economy, Featured, Mars, Robert Zubrin, Stimulus Package17 Comments on Can a Mission to Mars Stimulate the Economy?